Beautifully engraved certificate from Overture Services, Inc.. This historic document was printed by the Security-Columbian Banknote Company and has an ornate border around it with a vignette of the Overture company logo. This item has the printed signatures of the Company's Chief Executive Officer and Secretary. Overture Services, Inc. is a global leader in commercial search services on the Internet. Overture�s paid placement search service is comprised of advertiser generated listings, which are screened for relevance and accessed by consumers and businesses through Overture�s affiliates, a network of Web properties that have integrated Overture�s search service into their sites or that direct user traffic to Overture�s sites. In some cases, consumers and businesses access our search listings directly at our sites. The search listings are ranked according to the advertiser�s bid; the higher the bid, the higher the ranking. Advertisers pay Overture the bid price for clicks on the advertiser�s search listing (also known as a paid introduction, click-through or a paid click). 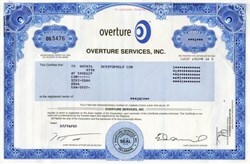 As of June 30, 2003, Overture and its wholly owned subsidiaries operated the Overture service in the United States, Ireland, United Kingdom, Germany, France, Italy, Japan and South Korea. Overture was incorporated on September 15, 1997 in the state of Delaware and officially launched its operations on June 1, 1998. On October 8, 2001, we changed our corporate name from GoTo.com, Inc. to Overture Services, Inc. and changed our Nasdaq Stock Market trading symbol to �OVER.� Overture has its U.S. corporate office in Pasadena, California and additional offices including California, Illinois and New York in the United States, Ireland, United Kingdom, Germany, France, Japan, Norway, the Netherlands, Italy, Spain and South Korea. Overture Becomes a Wholly-Owned Subsidiary of Yahoo! SUNNYVALE, Calif. & PASADENA, Calif.---Oct. 7, 2003--Yahoo! Inc. (Nasdaq:YHOO), a leading global Internet company, and Overture Services Inc. (Nasdaq:OVER), a global leader in commercial search services on the Internet, today announced the completion of Yahoo! 's acquisition of Overture. As a result of the merger, Overture is now a wholly-owned subsidiary of Yahoo!. "We are excited to combine the two companies to build the largest position in the rapidly growing Internet advertising market," said Terry Semel, chairman and chief executive officer, Yahoo! Inc. "We believe the combined companies will provide the most diverse set of integrated marketing solutions on the Web for small and large businesses, as well as extend our advertising capabilities across the Yahoo! network and around the globe." Overture is the leading provider of commercial search with more than 100,000 advertisers globally. Overture's assets also include an extensive affiliate distribution network that both Yahoo! and Overture are dedicated to maintaining and enhancing. In addition, Overture has built a world-class technology infrastructure in commercial and Web search, as well as an extensive intellectual property portfolio. The combination also furthers Yahoo! 's objective of becoming the leading end-to-end integrated search provider, combining assets capable of generating, distributing and monetizing search results. The two companies anticipate that they will be able to expand marketing opportunities on the Yahoo! network through the expansion of commercial search into vertical properties such as shopping, travel and yellow pages and integrating contextual advertising throughout Yahoo! 's network. In addition, Yahoo! will be able to leverage Overture's efficient, scalable marketplace by offering Overture's large base of advertisers additional Yahoo! services, and by expanding their combined products internationally. "Through this combination, we believe Overture will be better positioned to deliver superior results to our users, marketers and distribution partners, and ultimately drive greater value for the combined companies and our shareholders," said Ted Meisel, president, Overture Services. "Overture pioneered commercial search, and we believe this is the right step to help us fully take advantage of the huge upside potential in the commercial search segment." Overture's operations will remain in Pasadena following completion of the acquisition. Ted Meisel will continue to lead Overture's operations and will report to Dan Rosensweig, Yahoo! 's chief operating officer. "The acquisition provides Yahoo! with outstanding and complementary personnel and technology to help Yahoo! become the most essential provider of Internet services for consumers and businesses," said Rosensweig. "We have undertaken an extensive integration planning process covering an array of functions and business units, resulting in a comprehensive integration plan that we intend to begin executing against immediately." As a result of the merger, which was completed on October 7, 2003, each outstanding share of Overture common stock (other than shares for which appraisal rights are sought under Delaware law) has been converted into the right to receive 0.6108 of a share of Yahoo! common stock and $4.75 in cash. Yahoo! Inc. is a leading provider of comprehensive online products and services to consumers and businesses worldwide. Yahoo! is the No. 1 Internet brand globally and the most trafficked Internet destination worldwide. Headquartered in Sunnyvale, Calif., Yahoo! 's global network includes 25 world properties and is available in 13 languages. Overture is a global leader in commercial search services on the Internet, providing new and more powerful ways for businesses and customers to connect online. Overture pioneered commercial search by aligning the interests of consumers; its more than 100,000 active, paying advertisers; and its distribution partners, including Yahoo!, MSN, Lycos, and CNN. The company offers a full suite of Internet search products and search-related services. In addition, the company operates the AltaVista.com and AlltheWeb.com Web sites. Founded in 1997, Overture is based in Pasadena, with U.S. offices in New York; Chicago; and Palo Alto, Calif. The headquarters for Overture's non-U.S. business is in Ireland, with offices across Europe, Asia, and Australia. On July 14, 2003, Yahoo! (Nasdaq:YHOO - News) and Overture signed a definitive agreement for Yahoo! to acquire Overture subject to certain conditions. For more information about Overture, visit www.overture.com.